Figure 2.7 The column masses of gas and dust in the solar nebula disc well into the stage of dust condensation. materials - CO2 more volatile than water, CO more volatile than CO2. Thus, all of these icy materials are more volatile than water and so have minimum condensation distances that are greater than that of water. 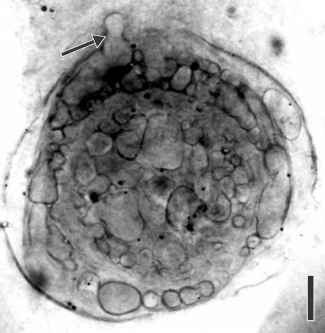 Some evidence for extensive though incomplete evaporation of dust, followed by recondensation, is provided by meteorites, where a proportion of their refractory and not-so-refractory substances have isotope ratios that differ markedly from the Solar System average. This would be the outcome if these proportions had survived evaporation - material that has not been recondensed from a nebular gas retains an imprint of its origin beyond the Solar System. What indications are there already that we will get two zones in the Solar System, with terrestrial planets in the inner zone and giant planets in the outer zone? At the stage we have reached, the dust grains throughout the nebula are tiny, with sizes in the range 1-30 ^m(1 ^m = 10-6m), as observed in circumstellar discs (Section 2.1.4). The grains now grow slightly by acquiring atoms and molecules from the gas, rather as raindrops grow by acquisition of water vapour. This slow-growth phase is accompanied by an increasing tendency for grains to settle to the mid plane of the disc, a result of the net gravitational field and gas drag. This tendency increases as the turbulence in the disc dies away and as the grains grow in size. There is thus an increasing concentration of dust around the mid plane of the nebula, forming a very thin sheet of order 104km thick. The rest of the nebula is much thicker and much more massive, and consists of gas, mainly H2 and He, and remnant dust. This is shown in Figure 2.8 for the inner part of the dust sheet, where the thickness of the dust sheet has been greatly exaggerated. Note that the sheet gets thicker with increasing distance from the Sun, i.e. with increasing heliocentric distance. 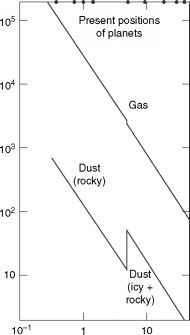 □ So how (except for the step up at the ice line) can the column mass of the dust decrease as in Figure 2.7? As the heliocentric distance increases, the mass of dust per unit volume of the sheet decreases faster than the dust sheet thickness increases. This is mainly because the dust grains are further apart, and not because they are smaller.